Burly, tricked out, super-powerful SUVs don’t really work for me. They’re too big and heavy, and the only thing that those men back at the factory have done by giving such cars excessive power is allow them to go fast in a straight line. Their massive weight and inherent higher centre of gravity makes cornering at high speeds an absolute mess. And that’s a big put off for any performance vehicle. But that’s not the case with the two behemoths you see here. Porsche makes great sportscars, and their engineers have a good understanding about high-speed cornering better than most others. When they set out to make their maiden SUV, the Cayenne, they surely didn’t want it to drift away from that notion. Soon after, Mercedes offered their ml to the savages at AMG tuning division to pump it up. 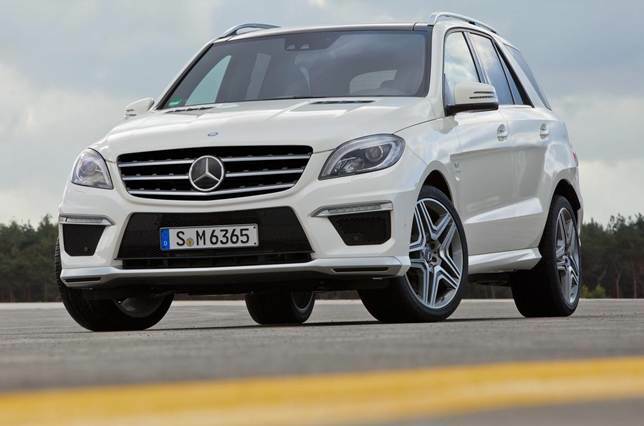 The outcome – the ML63 AMG – an SUV that loves corners and speed at the same time. But there’s one question that continues to linger in my mind – why on earth would you buy a super-powerful, gas guzzling, bank-account-destroying SUV? If you want to go fast, it’s simple, you’ll buy a sportscar. If you want to go off-road, you’ll buy the regular SUV. So, the only reason why you’d want one of these is if you want to go fast where there’s no tarmac. And to find out which one of these is better at that, we called up a friend who makes a living out of making homes for people, borrowed a piece of his under-construction land and took the leash off both these powerhouses. First, let me talk you through those the massive powertrains in the two SUVs – the Merc has the bigger 5.5-litre, eight-pot block, which develops an earth-shattering 760Nm of torque right from 2,000 revs and a full 550 thoroughbreds. If you look up the ML63 on the Merc website, it’ll tell you that it makes 525bhp, but this one has a performance pack that brings another 25 horses to the party. Dividend of this bi-turbo 5.5-litre V8 is the exhaust note that it gives out through the quad-pipes at the rear. It’s loud, it’s full of bass and the gurgle that it gives out will make you weak in the knees. But this motor isn’t a very high revving one – it doesn’t like to go over 6,000rpm. The Porsche on the other hand, is an avid fan of the revolution. It maxes out a healthy 6,700rpm and churns out 500 horses and 700 Newtons of pulling power in a linear fashion. Actually, this is not the most powerful Cayenne, there’s the Turbo S that develops 550bhp. For all practical purposes, you won’t really miss the extra 50. Despite having 50 horses less than the Merc, the Cayenne Turbo claims to hit 100kph in 4.7 seconds. And so does the Merc. But in our run with regular petrol (not 97 octane) fuelling both the engines, the Merc cracked a ton in 4.99 seconds while the Porsche did the same in 6.17 seconds. That’s partly because the car we had was two years old and had a good 20,000km prior to our escapade. The AMG’s engine is mated to a seven-speed auto ’box. In Economy mode, it’s easy going and subtle with the gear changes. In Sport, it holds on to the gears for longer and effectively communicates your spine with every shift in a cog. The problem here is that it’s not lightning quick – the way you’d expect it to be. The Cayenne Turbo doesn’t employ Porsche’s famous Doppelkupplungsgetriebe transmission, but an eight-speed Tiptronic one. It’s a tried and tested piece of machinery that functions well, but this too is not extremely brisk.